GRANITE SHOALS — Most people probably passed by the old, rusted-out ambulance parked in a Burnet business yard on Texas 29 without much thought. Just another piece of junk wasting away. Gene Thornhill saw something else. “God just put it in my heart,” he said. 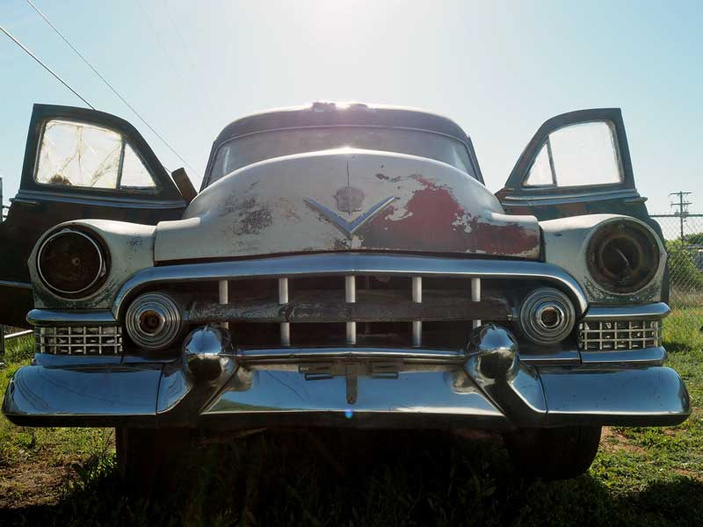 Gene purchased the 1951 Cadillac ambulance, which came without an engine or little else outside of the chassis, the body, and a whole lot of rust. He and his wife, Karen, managed to trailer it to a facility in Granite Shoals. Now, the onetime Air Force vehicle that once saved lives is transforming them. The Thornhills, along with some outside support, set up The Rod Project using the ambulance as a vehicle for change. “It’s about showing kids, yes, they may have a lot of dings, scratches, and worse, but with God, they can become much more,” Gene explained. Last fall, youth participating in The Rod Project began meeting Saturdays (weather permitting) to begin the vehicle's transformation — as well as their own. To Gene, the restoration job represents that no matter where you are in life or how bad you think things are, you can change your life for the better. On March 25, he gathered the kids around the ambulance’s dashboard, which they had previously removed, and applied a calcium, lime, and rust remover to it. He stepped back after wiping some of it off, revealing a surface sans most of the dirt and grime. The kids offered a litany of examples. Along with life lessons, The Rod Project offers participants job skills. As they revive the old ambulance, the youth learn the skills it takes to rebuild and fix vehicles. The initial phase focused on stripping off the rust, removing dents, and pulling out useless pieces. Gene and the students also spent time at Ed’s Upholstery in Marble Falls to learn how to re-upholster the ambulance's interior. “You know, when they go through the entire process, they’ll have some really good skills they can take and get a job with,” Gene said. As they progress, Gene hopes to add welding to the mix. Once they get to the point that it’s time to install the engine, there will be another skill learned. Peggy Sue Hesskew, whose daughter, Bethany Michelle, is part of The Rod Project, likes how it teaches so many different lessons. As a mom, Peggy Sue likes to see how the program stretches her daughter while offering lessons on how God can help her through life. Plus, skills such as upholstery, restoring cars, and even welding are things Bethany Michelle can use in a future career. Gene noted The Rod Project isn’t for everyone. Some kids come a few times, realize it’s not something in which they’re interested, and move on. He’s also watched kids come in a bit apprehensive and blossom throughout the process. “That they’re willing to try, willing to do something that’s not something they thought they could do, well, that’s a good step in life,” Gene said. The plan is to complete the ambulance and begin showing it. Once the ambulance is done, Gene said they’ll move on to another vehicle. The subsequent projects will go up for sale with all the proceeds going back into The Rod Project and scholarships for the participants once they head to college or trade/technical training. Several organizations and businesses have donated funds, materials, and supplies, but there’s always a need for more. Anyone interested in helping may call Gene at (512) 216-0820 or Karen at (830) 534-4889. Check out The Rod Project’s Facebook page (search for "Rod Project Granite Shoals") for more information or to track the progress of the project.